Yay — I love to hear when a new recipe becomes someone’s new favorite dessert! This tart really is incredible. I thought the canned pears worked out well, too. Yours looks fabulous. And I bet it really was a breeze after that yule log! Glad you and Master Chow loved it! I too loved the chewy-like “crust” — kind of a like ooey-gooey bars. You can sub cream cheese for the shortening? What a fabulous idea! I had no clue to even think about that. And I’m sure that this was a piece of “tart” after that yule log. I liked the tart more than the log ;-), I agree with your husband, great dessert. Love the idea of the cream cheese in the crust – who wants to eat shortening anyway? Beautiful tart, so happy it was such a success! What a great way to change the crust up. Looks lovely. I am still wishing I’d used canned pears.. Right on with the salt in the almond cream! I’m doing that next time. I bet this was great with a pie crust but I have to say that I loved Dorie’s tart shell, too. Love the vanilla/rum combo. I will definitely try that next time. What a compliment! It looks fabulous. Yum! Your tart looks perfect and delicious. The cream cheese in the crust must have been unbelievable! i hate that i’m missing this week’s recipe. it looks so wonderful and delicious! great job. thanks for the catch on my coconut bun recipe. I fixed it just for you! I agree with you — it’s a wonderful dessert. I used unblanched almonds as well — I don’t really think it matters, because it tastes so good. Master Chow has great taste…everyone here loved it as well! Yours looks very elegant and light and divinely good! I love desserts made with pears. Your tart looks amazing. yep, my husband is on that long list of spouses who adored this recipe. I gave him the last piece for dessert tonight. He’s become quite the Dorie fan after all these weeks of great desserts! If I didn’t have a package of blanched almonds in my drawer it would have been unblanched all the way for me too. I had a can of pears as a back up because mine looked too ripe. It all worked out in the end. I’m interested in your crust variation but we loved the sweet crust so much that I’m not sure I could vary it for this recipe! But I’ll keep that in mind for a future application b/c shortening sort of gives me the willies. Next time, I’m not fighting the canned pears. Wait. Did someone say “cream cheese”? I agree with you completely- this is a new favorite dessert! Yours turned out beautifully! Your tart looks ever so French. My husband really liked this one also, having two pieces. Your tart looks beautiful! I love the crispy/chewy top! Mr. SGCC proclaimed this one as a new favorite too. Impressive, because he rarely eats sweets. I LOVE this tart…love, love, love it! Your tart looks delicious. I really liked the way the filling and crust came together, too. Great texture. I used canned pears too, which made this so easy. Your filling is the perfect color… nice job! Your tart looks gorgeous! I too used canned pears and loved the simplicity of it. Glad you guys enjoyed it! Your tart looks tastily tempting. Glad y’all liked it. Guess I will have to break down and bake it. Gotta love a recipe that calls for canned pears! 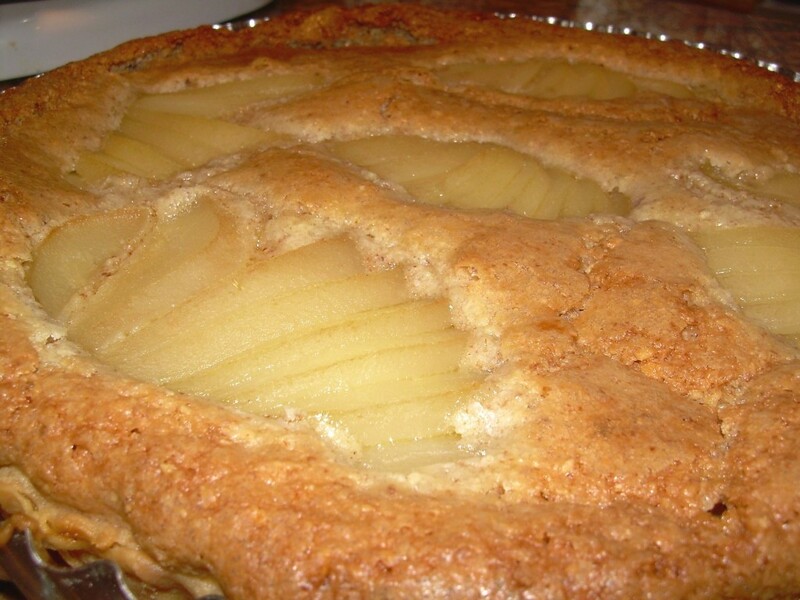 Your tart came out perfect and this is now a favorite in our house! I know what you mean feeling like a groupie. I think your tart looks delish, I’m not surprised Mr. C loved it! I loved this tart, too; in fact, I believe it is my favorite of nearly all the Dorie recipes I have baked. The canned pears are a dream to use. I like the cream cheese in the crust-sounds delicious.